What drink do you suggest for the delicate palate of the cocktail neophyte? Something boozy and balanced, sure - but one wrong suggestion could relegate the newbie to a beer-drinker’s life. To which go-to cocktails do you turn to when faced with the challenge? This probably isn't the place for love-it-or-hate-it flavors like anise, so I wouldn't go with something like a Monkey Gland. Nor would I go for, say, something with a pretty unusual flavor profile, like a Blood and Sand. But how to initiate the cocktail virgin into a lifetime of bibulous enjoyment? Well, the first real cocktail I ever ordered -- aside from the Lemon Drop that a cousin foisted on me on my 21st birthday -- was a Manhattan. I was in a hotel bar in Los Angeles on a business trip, and wanted something interesting to drink that had whiskey in it. I knew what was in a Manhattan, but I'd never had one. As luck would have it, the bartender at the Radisson Downtown made a perfectly creditable specimen, and I was hooked. The Manhattan was my go-to drink for quite a while, and when I discovered what bitters brought to the taste, it was even better. I branched out a little here and there -- I was well on my way to becoming a cocktail dork when I had a superlative Sidecar for the first time -- but it was an encounter with a Corpse Reviver No. 2 that really showed me what a cocktail could be. 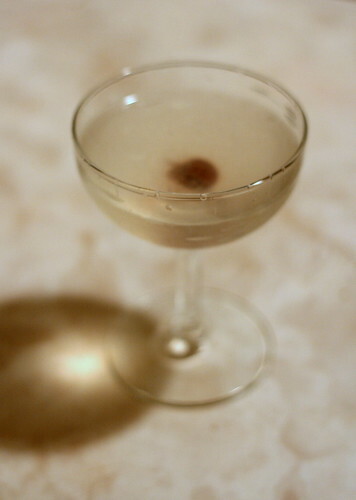 But, I don't think a Corpse Reviver is the right drink to intiate a cocktail newbie -- you've got to measure everything carefully and make it just right in order for it to be balanced, or else you wind up with junk. And that could easily strike the neophyte as just too fiddly to bother with. Let them work up to it. Rather, what I'd recommend for a first cocktail is something that's simple and balanced, and will hopefully provide a revelatory new experience, with a bit of elegance to boot. Something like the Aviation. It only has three (or perhaps four) ingredients -- more on that momentarily -- but offers a wealth of interesting tastes. There's sweetness and acid, fruit and herbaceousness, all working together and giving way to each other. The gin ties the drink together (but no, this isn't a Caucasian), the Maraschino adds the fruit as well as some earthy and nutty notes, and the lemon gives you acid and those wonderful citrus oils. You can taste each individual ingredient without too much effort, and yet you get the synergy of a well-balanced drink. What better way to get someone interested in the possibilities of cocktails? From there, it's a natural step to explain how sours work, and show the various other family members (e.g., Bacardis, Margaritas, Kamikazes/Cosmopolitans) and how they fit together, and hopefully you'll have a cocktailian on your hands before too long. Shake with ice and strain into a chilled cocktail glass, and garnish with a homemade Maraschino cherry. The Aviation was the cocktail that led to my downfall - after reading it I was irretrievably hooked on classic cocktails. Paul Harrington's book did me in.